There is always time pressure in the day to day operation of your practice and occasionally clinical notes get missed. Instinctive Notes helps you keep on top of your clinical notes with tools to intelligently manage your backlog. When you don't have time to complete the full treatment note you can easily start with a draft and then complete the note at a later time. When saved, the draft note is placed in a special "Draft Visits" list so it's easy to find and return to when you have time to complete all the information you wish to record. The "Drafts Visits" list includes a badge which shows how many drafts have been saved and are awaiting additional information to complete. To take a draft note you simply take the note details as normal, but instead of tapping "Update All" when you are finished just tap "Cancel" button. Instinctive Notes will ask if you wish to save a draft instead of cancelling. Drafts are regular treatment notes under the hood so if you complete the scheduling section in a draft it will immediately become available on au.instinctvenotes.com so that your assistant will be able to see those details when booking in your client for their next appointments. The Instinctive Notes App helps you keep on top of your notes by recognising when you have missed a clinical note and stores the appointment in the "No Notes" list. During the day all your appointments for that day will remain in the standard appointments list so it is easy to go back to an appointment from earlier in the day and record a note that you haven't had time to complete. Overnight, the Instinctive Notes App will take any appointments where no clinical notes have been recorded and will move them automatically to the "No Notes" list. The "No Notes" list includes a badge which shows how many appointments are missing clinical notes so you can tell at a glance what needs to be completed. The "No Notes" list operates just like the appointments list, simply select an appointment from the list to a client's history and record a clinical note. By default the "No Notes" list only shows appointments for the past 30 days. To check if there are outstanding appointments beyond that just pull to refresh the list. There are times when an appointment on your list is no longer relevant or is there in error. If you integrate with a practice management system (like Cliniko) then appointment cancellations, deletion and no-shows will be processed automatically and removed them from your appointment list. There may be some rare cases where appointments which should be removed are missed and require manual removal. If you upload your appointments to Instinctive Notes Standalone then only future cancellations and deletions are removed. It is likely in this case that some appointments will need manual removal, particularly for no-shows and late cancellations. In both cases it is easy to remove an unneeded appointment from the Instinctive Notes App. Just swipe left on any appointment and tap the "Delete" button and it will be immediately removed. The appointment will be updated on the Instinctive Notes Web Service so that it does not return on this device and will be removed from all other devices you use. This action signifies that you do not need to take a note for the specific appointment. 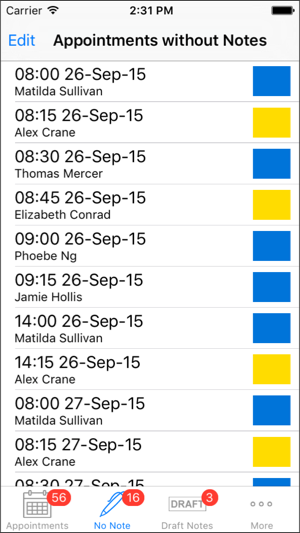 Alternatively you can tap the "Edit" button at the top left of the appointments list to remove multiple appointments at one time. Removing appointments is possible from both the Appointments list and the No Notes list. If you have a substantial amount of backlog which does not require notes then we are able to bulk remove some or all of it for you. Just contact our support team with your request and we will remove the backlog directly. Generally we will leave 4 weeks of backlog appointments in place to allow you to return and complete those appointments which were missed but should have had notes. If you would like to keep less or more of you backlog then just let us know in your request. Keeping up to date with your clinical notes is a necessary and important part of running your practice. Missing a note could impact how you treat your client or leave gaps when you share client history with colleagues. Instinctive Notes supports keeping up to date with your notes, by allowing you to take draft notes whenever necessary and keeping track of appointments which are missing notes. So now you know how to manage your appointment backlog right on your device. As always you can check out our other support resources or contact our support team if you have further questions.